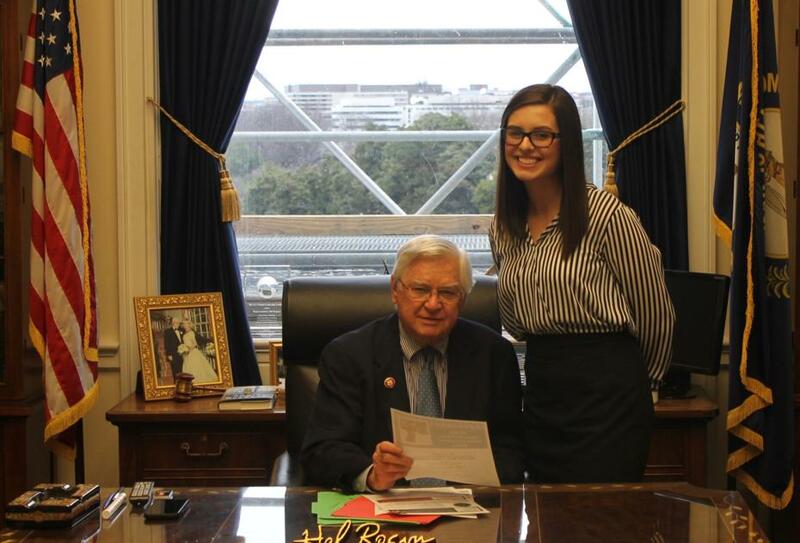 WASHINGTON, DC -- U.S. Rep. Harold "Hal" Rogers (KY-05) welcomes Katelyn Hughes to Washington, DC as part of the University of Kentucky's "WilDCats at the Capitol" Internship Program. She is a 2017 graduate of Grace Academy in London, Kentucky and a Pre-Law student at the University of Kentucky. "It is always a pleasure to support our brightest students, like Katelyn, as they explore public service and government operations in our nation's historic halls of Congress," said Congressman Rogers. "Katelyn has jumped right in, assisting people from across Southern and Eastern Kentucky, while learning the ropes on Capitol Hill. She is a delightful addition to our DC office with a compassionate heart to serve the people of our region." Hughes is a junior at the University of Kentucky, where she is majoring in Sociology with a minor in Psychology. She a Pre-Law student who hopes to become a child advocate attorney working to protect and serve children in Kentucky. Hughes has served as Children's Pastor at Grace Fellowship Church in London, Kentucky since October 2017. To learn how to apply for an internship with Congressman Hal Rogers, visit https://halrogers.house.gov/internships.